A few weeks ago, I wrote to Dr. Paul Knoepfler after reading his book Stem Cells: An Insider’s Guide because I was intrigued by his stem cell theory of aging. I wondered if his theory might mean that someone who mobilized and donated hematopoietic cells might be shortening their own lifetime supply. After exchanging emails about my daughter’s experience, he invited me to contribute a guest blog as he felt that the complexity of her experience as a donor and the questions I was raising would be of interest to the stem cell community. Peripheral blood stem cell (PBSC) donation is a miraculous treatment that provides people with high-risk forms of blood cancers and other immune diseases a last chance for a cure when other treatment options are exhausted. As of December 2012, the number of hematopoietic stem cell transplants worldwide passed the 1 million mark, a remarkable accomplishment reported in a retrospective study published recently in The Lancet Haematology. Data collected by the Worldwide Network for Bone and Marrow Transplantation showed that across 75 countries, 42% of hematopoietic stem cell transplants (HSCTs) were allogeneic and 58% were autologous. The preparation for cancer patients prior to receiving a donation is brutal. Their immune system is wiped out with high doses of chemotherapy and/or radiation therapy so their body is ready for an infusion of healthy, donated hematopoietic stem cells that hopefully find their way into niches in the bone marrow where they divide and produce healthy blood cells. The human leucocyte antigen (HLA) match between the donor and recipient must be as close as possible to minimize the risk of rejection. It’s a remarkable treatment that helps many critically ill people. But what are the short and long-term risks for healthy donors? 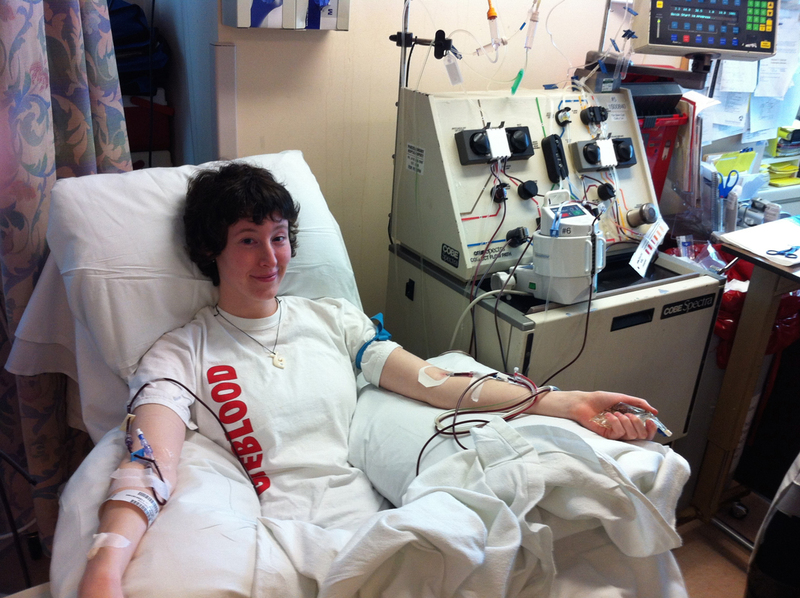 Those were the questions I was contemplating in the spring of 2013 when my daughter Katherine, 22 at the time, turned up as a perfect match for an unknown patient in the bone marrow registry. I was worried about her decision to donate from two different perspectives: as her mom; and as a health journalist. As her Mom, I was proud that Katherine had a big heart and the courage to donate a gift of life to a complete stranger. According to some reports, only about half of the people who are identified as matches in the bone marrow registry follow through. This was the child who had to be bear-hugged for childhood vaccines, so I was surprised she was volunteering for a procedure that would mean self-injecting a growth factor drug, twice a day for four days, followed by leukapheresis, which requires being tethered to blood filtering equipment with cannula in both arms for hours. I also wondered how she would manage the stress, given that the donation was squeezed in between grad school interviews, final exams and her thesis presentation in her final year of university. The information provided by Canadian Blood Services’ OneMatch Stem Cell and Marrow Network said that donors would feel tired and achy for 5-7 days and there were possible complications of spleen rupture, but those symptoms would return to normal fairly quickly after donation was completed. The FDA approved the drug Neupogen in 1991. The drug contains the active ingredient filgrastim, a granulocyte colony-stimulating factor. 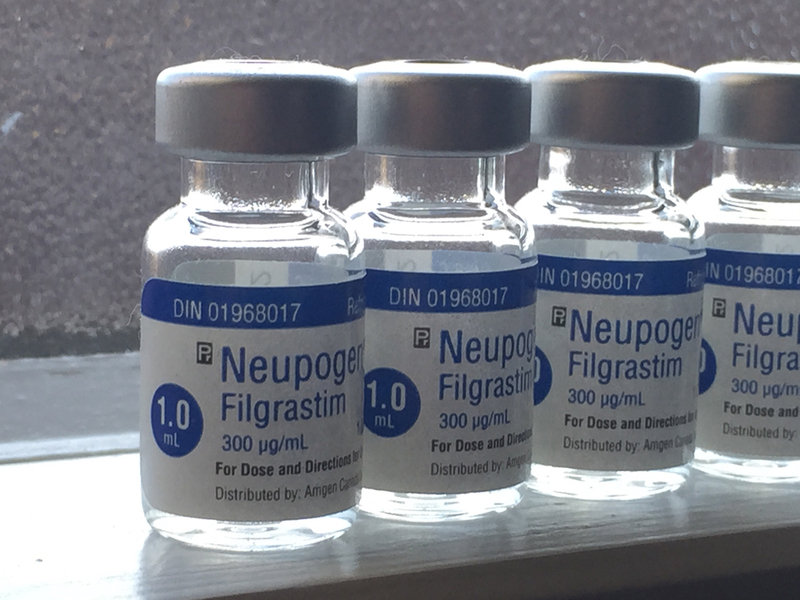 The FDA approval and subsequent updates show that Neupogen was approved for autologous use among cancer patients, with no mention of allogeneic use by healthy donors. There is also no mention of healthy donors in the prescribing information. A 2007 paper in the British Journal of Haematology mentions that since 1997, the US National Marrow Donor Program has maintained an Investigational New Drug application for the manufacture of PBSC products from unrelated donors and that “it is unknown whether filgrastim increases or decreases an individual’s risk of developing cancer” but added, “based on limited long-term data from healthy people…no long-term risks have been found so far.” Not exactly reassuring. The only prospective trial I could find assessing the safety of filgrastim-mobilized stem cell donation and PBSC leukapheresis among healthy donors is currently underway and will not be completed until January 2022. The description says that filgrastim is “not a licensed indication,” and mentions that data collection began in February 1997. So the crux of the decision came down to this: should she risk an unproven drug treatment so that she could give a complete stranger another chance at life? As a 22-year old adult, it was Katherine’s personal decision to follow through. She self-injected filgrastim twice a day and had the usual symptoms of bone aches, headache, and fatigue. She donated over two days, tethered to the apheresis machine for about 5 hours each day in a room where the other 10 treatment chairs were filled with cancer patients receiving chemotherapy and plasma treatments. It was an odd juxtaposition for everyone involved, but the equipment and staff were located there. A second day is not always required, but it turned out that the recipient was apparently 15 kg (33 lbs.) larger than she was and the target collection calculation depends on body weight. After her donation days, she traveled by train back to her university town three hours away to study for final exams and work on her thesis presentation. Three weeks later, she had an enlarged spleen scare, which prompted a visit to her local hospital ER via ambulance and had to restrict her activity to prevent a ruptured spleen. The donation hospital in Toronto then requested she travel back for a check a couple of weeks later. By then, thankfully, her spleen was back to normal size. She was well enough to do a karate grading a few weeks later and over the last two years, has had no complications. At the one-year mark, she contacted OneMatch to find out if it would be possible to exchange contact information with the recipient, as the rules allow for that if both donor and recipient agree. She learned that the recipient lives in a country where there is a two-year restriction on information exchange. She doesn’t really want to know the recipient, but someday would like to know how they fared with her gift and if it made a difference. Is it admirable to donate and give someone else a chance at life? Of course! But I wish donors could have more information on how the procedure might affect them in both the short and long term, to understand more about what they are risking in order to help someone else. Here’s hoping that the study currently underway finds minimal risks for donors. In the meantime, it was great to get some perspective and reassurance from a scientist working in the stem cell field. Jane Langille is a health journalist and mom based near Toronto, ON, Canada. Katherine is very brave and kind. I doubt that siphoning off a few adult stem cells really does much damage in and of itself. (Bone marrow extraction hasn’t hurt me.) What’s probably more important is exercise, rest, and appropriate nutrition to keep them healthy throughout life. What a wonderful daughter, and an informative article. Kudos to everyone involved in making both happen. May I suggest you send the article on to Gina Kolata or Jane Bryant at the NYT. While this is a fine blog, the article deserves an ever wider audience. Thank you for your kind feedback. My hope is that with advances in regenerative medicine, this type of donation may no longer be necessary in the future, that it will be possible to make a new supply of stem cells from the recipient’s own cells. In the meantime, I think it’s important to consider the potential risks of this procedure for healthy donors.